You’re sitting with a 5-high poker hand, yet find yourself about to scream for joy. Have you lost your marbles? On the contrary! You’re holding the holy nut of a hand in an exciting poker variant called Razz poker, in which low-ranked hands rule the roost. Razz is roughly as old as Seven Card Stud, remaining on the radar of most poker players from just after World War I until the 1950s or so. Going dormant for a couple decades, it was resuscitated by being included in the World Series of Poker in 1971. Except for 1974, it’s been part of the yearly tournament ever since. As a matter of fact, Seven Card Stud players don’t have too much to learn to grasp Razz because their betting structures are essentially the same. It’s mostly a matter of learning to value low hands. After that, it’s poker, baby! The two most significant departures from Seven Card Stud are in the areas of card values and hand ranks. First, aces always count low. Second, neither flushes nor straights count in the hand rankings. Those are probably the biggest adjustments for new Razz players to make. Also, low hands aren’t qualified by a rule like “8 or better”. Razz features seven betting streets. In two stakes, fixed-limit games (which are the most common) players bet the lower limit stake through Fourth Street and the higher limit stake the rest of the way. Obviously, all but one player might fold before a showdown. But let’s walk through a two stakes, fixed-limit game in which two or more players make it past Seventh Street to a showdown in order to illustrate the play. Hand NamesIn Razz, only the best hand has a nickname – several, in fact. Known as “the wheel”, “the nuts”, and “the holy nuts”, a five-high hand of 5-4-3-2-Ace is literally unbeatable. It’s also sometimes called “the bicycle” or “the bike”. The second best hand is a six-high, followed by a seven-high, and so on. Although you can win big on these hands, they haven’t managed to capture the imagination of Razz players to the point of naming them anything special. And while you’ll see other hands that have well-known nicknames, they’re usually higher hands of no interest to Razz players. After all players ante the lower limit amount, each is dealt two face down hole cards and one face up door card. The player with the highest door card “brings it”, i.e. acts first at the lower limit amount. Suits break any highest door card tie in the order of spades, hearts, diamonds, and clubs. Clearly, a player with a king of spades door card would act first. A fourth card is dealt up to each player, and Fourth Street betting commences. Bets are still at the lower stake level, and the lowest visible hand acts first. 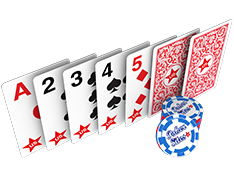 In case hands tie, the player closest to the left side of the dealer button acts first. Other players act in clockwise order. Fifth Street begins after players receive a fifth card dealt face up. From here on in, the higher bet amount is in play, including for raises. Fourth Street rules on who acts first continue on for the rest of the streets. The same rules apply to Sixth Street, which is after a sixth card is dealt face up to players who are still in the game. Finally, remaining players receive a seventh card face down and bet Seventh Street as they did on Sixth Street. If only one player survives Seventh Street, they win. Otherwise, remaining players engage in the showdown in which they reveal their hands to see who has the lowest hand. The first player to show is the last that opened or raised on Seventh Street, followed by others in clockwise order. Players who see they’ve already been beat can muck their hands, i.e. concede by not showing them. Note that Razz hands can tie. In that case, neither a sixth card nor card suits determine the outcome. Rather, tying players divide the pot evenly. Also, it’s possible to run out of cards in an eight-player game in which too few players fold. In that case, a single community card is dealt face up on Seventh Street. At most, Razz deals each player three hole cards and four up cards. 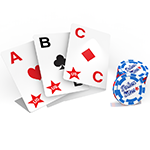 A player can use one, two, or all three of their hole cards to make the lowest five-card hand. Razz can be played in limit, pot limit, spread limit, and no limit formats. Two to eight players fit comfortably into a Razz game. Ace-2-3 is the best starting Razz hand, but dealt only 0.29% of the time. While sometimes slightly disorienting to the first time player for having to achieve the lowest ranked hand, there’s really nothing too difficult about Razz. It’s the Seven Card Stud you know and love, with just a few twists. There’s not even much of a lingo learning curve apart from the various names associated with the best possible hand. But as in any game of skill, there are better and worse ways to play. Hand valuation that compares outs odds to pot odds from street to street is always in a skilled player’s arsenal, and our extensive guides to poker strategy cover that topic in detail. But while Razz strategy is a huge topic, we’ve distilled it down to the top three tips to position you well from hand to hand, especially if you’re a Razz novice. It’s hard to win a Razz game with a pair, and even a high card greater than an eight can doom a hand. Get out of the game the moment your hand drifts into rarified hand territory. It’s always better to fold on a marginal hand than to hang on in hopes that other players will experience disaster. If you have decent unpaired low cards and other players’ up cards include those that would pair cards in your hand, you’re at a significant advantage because you can’t receive those pairing cards. This is an extremely strong position to be in. In the special case where you sit right of the bring-in player, if everyone ahead of you folds, you should raise if your door card is lower than the bring-in player’s door card. While there’s not a lot in the pot at this point, it’s a great opportunity to scare the bring-in player into folding and pick up an easy win. If you’re a US poker player who plays Hold’em or Omaha, you’ll have to adjust your mindset in order to win at the low-ball poker game Razz. While not as illustrious as its flashy Texas Hold’em sibling, Razz poker attracts great players and a lot of fan interest to its tournaments. Buy-ins for bigger Razz tournaments have typically been $1500 to $2500. 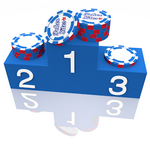 But 2014 saw the first ever $10,000 Razz tournament at the World Series of Poker.